Summary: Learn how to wire a plug and change a fuse. Plugs will be fitted with either a 13amp or 3amp fuse depending on the appliance, so take the old fuse with you when you need to buy replacements. If you have lost the old fuse, check the underside of the appliance for its wattage. 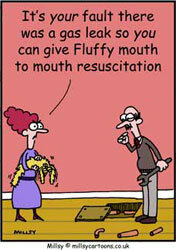 Anything over 700W will require a 13amp fuse. Unplug the appliance and unscrew the plug cover. Replace the fuse cartridge inserted. 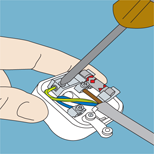 If the plug on your appliance is a one-piece moulded unit, you will have to cut the flex and replace the entire plug, following the re-wiring instructions below. Prepare the flex for connection by stripping about 40mm (1 1/2in) from the outer PVC protective covering at the end of the flex using a sharp knife. Avoid cutting or nicking the insulation on the colour-coded cores and separate the colour-coded conductors. The cores are connected to the flex connector by screw-down terminals. About 15mm (1/2in) of the colour-coded insulation needs to be stripped from each of the cores using wire strippers. With the coloured insulation removed, twist the strands of wire together. Unscrew the cover of the plug. Swing the grip that secures the cable to one side. Connect the cores to their terminals in the plug. Most plugs come with a picture template to illustrate the connections: blue to Neutral, brown to Live and green-and-yellow to Earth. Move the grip back into place to secure the flex and refit the plug cover, ensuring it is firmly screwed together. Swing the grip that secures the cable to one side and connect the cores to their terminals in the plug.